Clean Well Water Report: Can I Use a Water Softener After a Calcite Neutralizer? 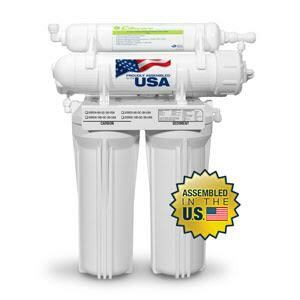 Can I Use a Water Softener After a Calcite Neutralizer? We recently moved to the country and are new to well water. We discovered that the toilet flush tank is stained blue, and if water drips from the faucet, we get blue stains. I realize that this is from our copper pipes and our water is acid. See attached lab test. 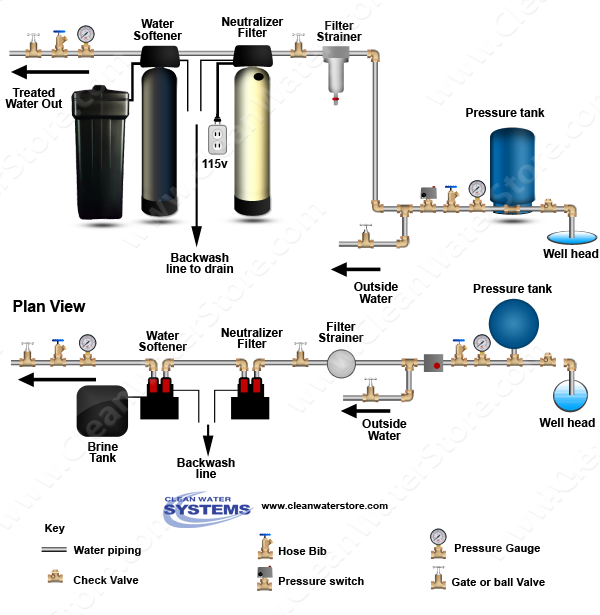 Our question is, can we fix the acidity and still use a water softener? My wife likes soft water and we had that at our last house. If we use a softener after the crushed marble tank, will that make the water acid again? This is a common problem and we have many customers in Maryland with acidic well water. Fortunately it is very easy to fix, by using a simple calcite neutralizer. As the water flow through the neutralizer the pH is raised to the neutral range of 7 – 7.5 and the blue stains should stop at that point. This does make the water a bit higher in calcium hardness and many folks do use a water softener after tne neutralizer to soften the water. This does NOT make the water acid again though. In fact a water softener does make the water acidic and the pH will still be in the neutral range. However, we do recommend that if you use a softener, it be left on bypass for several weeks after the neutralizer has been installed, to speed up the elimination of the blue staining and stop the copper corrosion. Then, when the softener is put online, it should be partially bypassed so the hardness is in the range of 3 – 5 grains per gallon. 3 grains per gallon is still fairly soft. This will allow some calcium to deposit on the pipe interior and keep corrosion to a minimum. A Calcite filter using Calcium Carbonate (Calcite) and Magnesium Oxide (Corosex) will neutralize the pH from 6.5 units and help eliminate the corrosive effects of the water. Many customers with this type of water used to have blue-green stains from copper pipe corrosion and after installing the Neutralizer see their blue stains & copper levels disappear within a few weeks. Due to the fact that Neutralizers will raise the pH they also increase hardness levels as well, in this case more than likely by at least 4 - 5 grains. 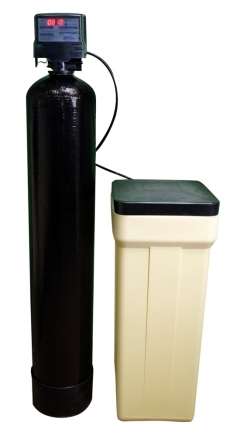 By implementing a Water Softener this would remove the hardness and stop water spots from occurring. Finally an undersink Reverse Osmosis installed at the kitchen sink will provide bottled water quality water available at your fingertips without having to deal with water jugs, etc. An RO also removes the salts and zinc like we talked about. Please see below for additional information on this recommendation, as well as attachments, and product links. Raises pH and prevents copper corrosion, uses standard tank with gravel. 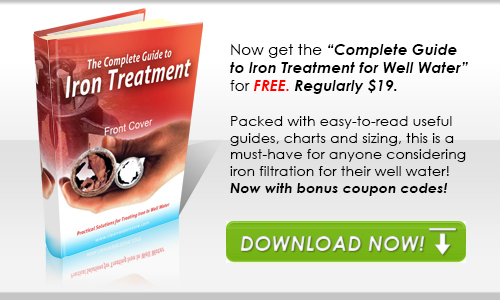 Includes Free pH test kit to insure of proper operation. Rugged heavy-duty digital backwash control valve features fully adjustable backwash and rinse cycles saving water and allowing maximized performance. Much longer life than cartridges or Upflow Neutralizers. Dimensions: 10" diameter x 61" height with valve attached. 1” connectors, 10’ Drain line, and bypass is included. Will ship in several boxes, all installation instructions are included in printed format as well. We also offer professional tech-support should you need it. Shipping weight: 176 lbs. Will arrive in several boxes, including a funnel and Manual as well as all installation instructions. We’re also available for professional tech-support should you need it. Includes 1” pipe connectors; by-pass valve; 1.5 cubic feet of heavy-duty Softener resin; heavy-duty brine tank; 10’ Drain Line, and 5900e Series digital metered-regeneration Control Valve. Ease of service along with a simple user interface are a big plus with this valve. Excellent quality and should last for years to come, typically 10+ as long as is backwashing normally and using the proper amount of salts. These are quite efficient with usage, thus would only regenerate based upon the gallons used and not by days of the week. Dimensions: 10”x 54” Tank, with the valve is approximately 61” tall. All instructions on assembly are included as is tech-support as well. Brine Tank is 16” x 16 x 39” Tall.